So you’re going to Ireland this summer and you want to know how you’re going to keep the kids entertained. You can rest assured that Ireland is well suited to young children. The kids may not appreciate the spectacular views and scenery, and may be on the young side to appreciate the beer 🙂 but you won’t have too many issues finding something for them to do every day. Ireland has got plenty of playgrounds (indoor & outdoor), museums, nature trails, movie theaters, beaches, zoos and other activities for the little ones. Going to Dublin? Try Dublin zoo and the fantastic playground in St. Stephen’s Green. The National Wax Museum and the Viking Splash Tour are also great activities for young kids. 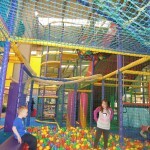 Of course there are plenty of indoor play areas too, for when the weather is not so great. Hulabaloo and MonkeyMaze can provide hours of entertainment and are a great way to let kids burn off some of the vast amounts of energy they have. Also take a look at this post on DiscoverIreland.com. There are some great suggestions on there for how to keep the kids happy while in Ireland. Looking for a Smart phone app to take with you on your travels? Check out Ireland – Are we there yet?, an Irish travel app packed with family-friendly activities, created by a Galway mom. Here’s a couple of books to take along with you that you can find on Amazon.com. Frommer’s Ireland with Your Family is written by local experts, gives prices and maps of the attractions, and includes some pretty useful insider tips. You could also take a look at Take the Kids Ireland for a different perspective on what Ireland holds for the younger ones. If you’re like me, and you like to flick through a book before you decide to buy, you’ll probably find these books in most book stores too. If you found a great online source for things to do in Ireland with kids, please share it in the comments below. Thanks! Liam – My kids love indoor playgrounds. Last year when we were in Letterkenny we planned to take them to Arena 7 which has a great indoor maze and slides. By the time we finished eating dinner the place was closing. My four were so disappointed, but believe it or not, the owner opened the area up just for them and allowed them to play away for an hour. “Only in Ireland,” is all that I could say. The owner said he didn’t want four disappointed little Americans leaving Donegal. Such kindness makes Ireland a wonderful place for kids. That’s a great little story 🙂 I suppose it’s hard to send 4 little kids away unhappy, but at the same time, it’s not too often someone would do what the owner did. I’m sure you more than appreciated the kindness – I can only imagine how tough it must be to entertain 4!